The Oakley brand is universally recognized and is synonymous with innovative, quality craftsmanship. Oakley is a leading name in sports eyewear because it offers athletes stylish eyewear that is made with cutting-edge design and technology so that it not only looks good but can also withstand harsh environments and truly extreme conditions. Oakley builds its optical frames with care and precision, and Oakley’s eyeglasses also feature top-quality materials, like O Matter® and Unobtainium©. Oakley glasses are made with a three-point fit system, which maximizes optical performance by holding the lenses in precise optical alignment. 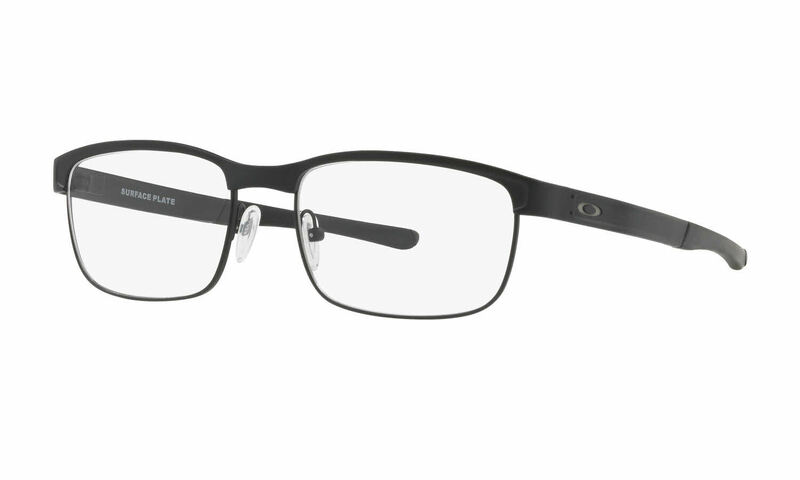 Oakley offers both lifestyle and performance eyeglasses that transition seamlessly from the office to the outdoors. Due to manufacturer's restrictions, Oakley products can only be shipped to U.S., Canadian and Caribbean addresses. APO/FPO shipping is available. Oakley Surface Plate is a Full Rim frame for Men, which is made of Titanium. Oakley Surface Plate Eyeglasses come with a cleaning cloth and protective carrying case. I love my new glasses. The clarity is amazing, and I think I can see better than I do with contact lenses of the same prescription. One of my lenses is a little thicker than the other due to my vision, and that thicker lens seems a little loose in the frame, otherwise this is the perfect pair of glasses. After wearing these for 2 weeks, I will have a hard time going to other brands. Like most Oakley Sunglasses, these squeeze your head a bit to help stay on. After a day of wearing these, you forget they are on, so that feeling of squeezing goes away. That means it is just the right size! Also, be aware that if your order the Blue Light Lenses, blue dots will appear close to light bulbs. But you eyes quickly adjust to these also. All in all, I would buy again in a heartbeat!